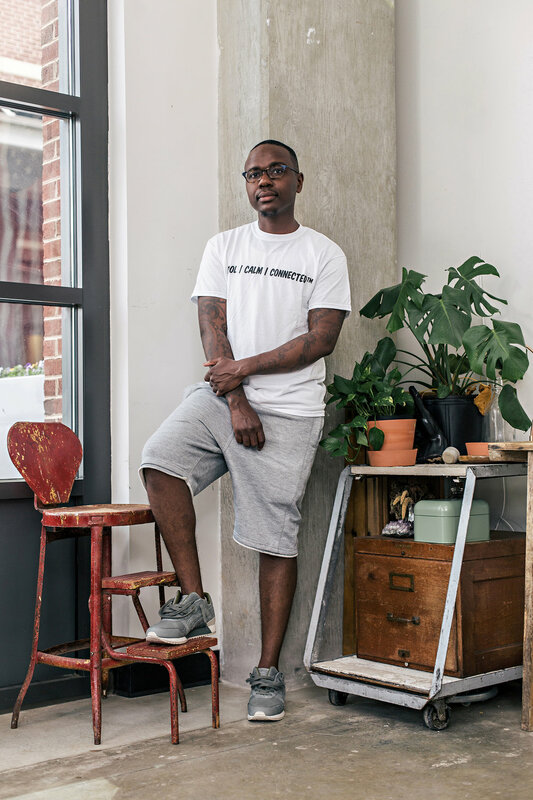 we're documenting the people whose projects + plans make this city #aCreativeDC. drop that ^^ ANTHOLOGY menu ^^ at top to view other galleries. and was shot at A Creative DC: Brookland, our studio on the Arts Walk at Monroe Street Market. What do you love about the DC creative community? I’m very grateful for a community that is welcoming and supportive of a European lost bird, openly shares their skill sets, focused on constantly sharpening each other. We make electronic soul music that draws from a wide range of sonic influences along with our own life experiences. What do you appreciate about the DC creative community? The art scene in DC is diverse and full of creatives that are invested in each other's success. We're piecing together material for something special later this year. I work on a little bit of everything at D.C. Music Download! The best thing about working on this project is that you really aren't confined to a particular role. We're a multi-faceted media group that spotlights D.C.'s best musicians through many different avenues. We have a daily online magazine that offers an in-depth, comprehensive look at the music scene, an events team that curates unique music experiences all around the city, and a videography team that elevates the storytelling we do on DCMD.com via cinematic, eye-catching visuals. I appreciate the D.C. creative community for its resilience and DIY ethos. Factoring in the high cost of living, limited financial resources and affordable art spaces in the city, it can feel like an uphill battle sometimes to try and sustain a creative project. You have to hustle and find ways to get over those hurdles, and there are a lot of amazing people in the community who do that day in and day out. They're here because they want to be here and grow the creative scene, despite the obstacles. It's inspiring to be a part of this community! After putting on our first music festival, D.C. Music Download is about to get even bigger! At the end of the year, we're going to relaunch D.C. Music Download's website that'll include a spin-off project that we're excited about! We've got several events lined up this summer too, so it'll be a busy year for us! I notice, highlight, inspire, and incubate up and coming talent. Its intelligence, diversity, and kindness. Who are you working with right now? Creative producer and buffalo wing connoisseur. Why do you appreciate the DC creative community? The diversity of the community which is a reflection of the diversity of the works, projects, shops, and events that are produced. Everyone has a unique creative voice and its always inspiring to see who's dropping what. SHAOLIN JAZZ engagements at various colleges and universities, our monthly CAN I KICK IT? event at Songbyrd (4th Tues of every month), conducting a special edition of CAN I KICK IT?, in association with the Smithsonian, for the opening of the Kung Fu Wildstyle art exhibition by Fab 5 Freddy and MC Yan, expanding our designs for SHAOLIN JAZZ product, partnering with the Downtown DC BID on a soon to be announced event series, curating a SHAOLIN JAZZ retail concept called Art vs Commerce (taking place in August of this year), personal art exhibitions, and design projects via Late Night Genius. I create 3D art and make figurative & abstract sculpture in marble, stone, and wood, "that's often direct carving." Also sculpture in bronze / terra cotta / and various mixed mediums. I also teach carving techniques, and clay modeling for portrait & human figure. I bring people together who probably wouldn't associate with one another otherwise. I introduce people to individuals, places, products, and ideas they've been seeking but didn't know existed. It's been a long time coming but I love how the DC creative community has figured out how to make business work for DC, while remaining in DC. It's important in order for there to be a true creative industry based here and supported by local residents and visitors. This shows all who are paying attention there's a group of people in the city who are equally serious about creating as they are about financially sustaining themselves. Give it a few more years and DC's creative community will be a force to be reckoned with. The All the Fly Kids Show - a weekly podcast where the cool, calm, connected talk straight, no chaser. New episodes released every Tuesday wherever podcasts are heard. Artist, neat freak, planner, lover of my "big fat" Italian family and all things chinoiserie, the smell of Meyers (lol). Owner and artist of Nicolette Atelier, a bespoke residential and commercial mural & decorative finishes studio. I recently launched Abstract Art Nicolette, a modern canvas art line under the NA umbrella. The diversity and organizations like A Creative DC...There are so many ways to get involved here! Growing the Abstract Art Nicolette collections and a chinoiserie dining room for a residence in DC. I promote the visibility and equity of black and brown folks in museum and art spaces. I am met with a genuine passion in support of one another's work, and most importantly, the protection of creative spaces by the creative community in DC. Contracting with local museums to engage online audiences in more expansive stories of marginalized groups. We bring a bit a joy to each other's lives and those around us. Before I was born this city produced greats like the Bad Brains and many others over the years, there's an energy in this city that you don't find anywhere else, it's a nest full of great ideas and thoughts just waiting to hatch. We are the art/creative director team for a brand/project call "That Feel Good Company", the message and theme is very simple creating things that bring happiness, joy, peace into people's lives through a variety of product and events. Coming soon. My artistic practice is focused on social justice, cultural and the organic environment as it relates to people. My mediums are painting, mixed media and printmaking. I am enthralled with the strength of the artistic practices within this community, and as such I believe we are unknowingly developing a 21st century art movement. I am working on a body of work that is examining water on a molecular level and its relationship to identity and memory. I have the first of this work on exhibit at the Scheslinger Performance and Art Center, located at the Northern Virginia Community College campus in Alexandria, Virginia. The exhibit, "The Relevance of Water" is in the Forum Gallery and will be up until May 7th. I make ideas come to life. Sometimes in built space, sometimes online, usually both. By day I manage placemaking for a REIT, by night I run etxe creative and cocktails+craft, designing and sharing experiences for social good. I love dancing, fiber arts, getting lost and talking to strangers. I moved here three years ago and reached out to three people doing interesting work. They all wrote back and met with me in person. They shared their stories, they listened to mine. DC has changed a lot, but the ability to connect and collaborate still remains. And when people move, our networks just get bigger and more global. This is what I love about DC. I am honored that I can now do that for newcomers. Growing cocktails+craft into chapters outside of DC. Finding help to create Malcolm X Meals. Teaching a course on placemaking through KCDC. All portraits by Sam Binutu of Sambition Photos. Your life looks good here.